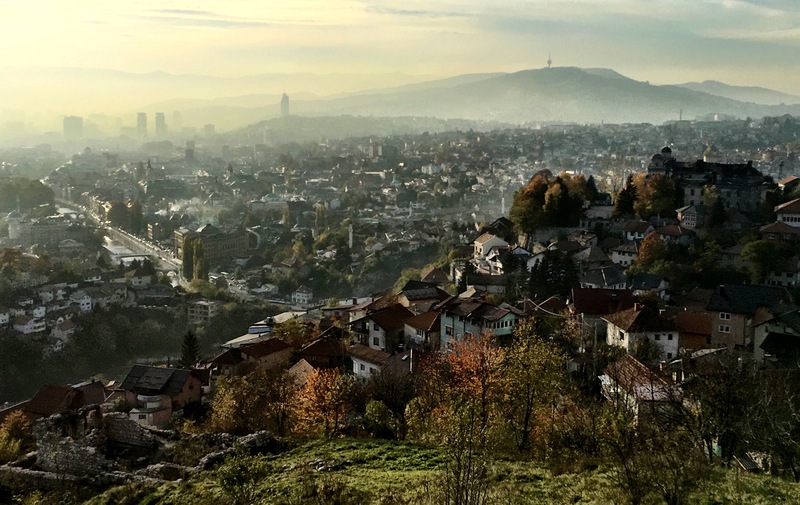 Sarajevo is one of those cities you can fall in love with at first sight. It’s lively and charming and has a beautiful history tainted with the sorrows of warfare. The old town is filled with cafe’s and restaurants; tiny joints that serve cheap cevapi (small grilled sausages served with bread and raw onion) and a thick yogurt to drink it down with. The city oozes with Turkish influences while still maintaining the scattered Austro-Hungarian landmarks that give the city a European edge. 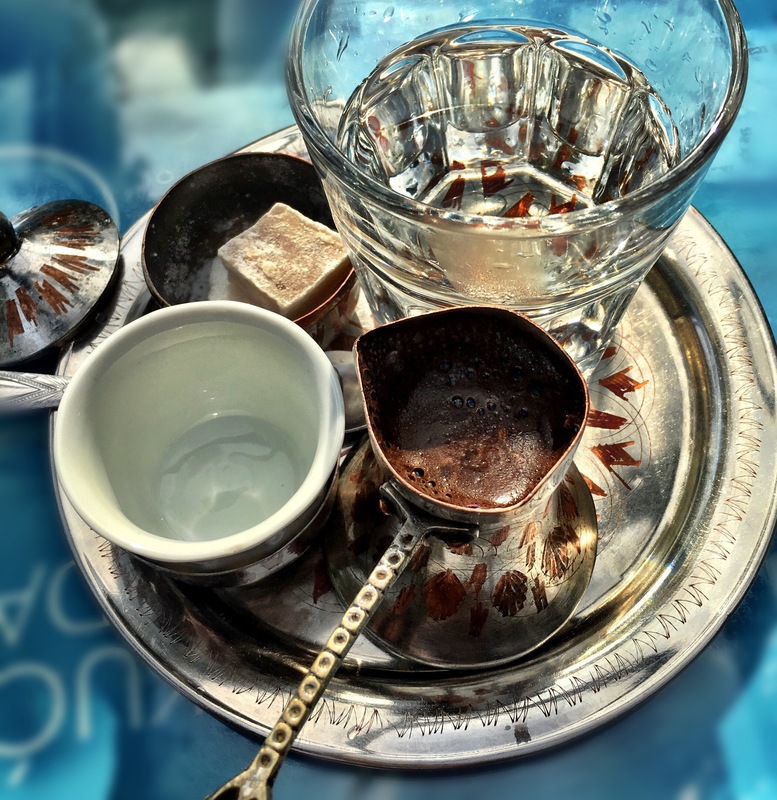 I could easily spend a week relaxing in the Bascarsija, sipping on Bosnian coffee with a good book. Nothing more. 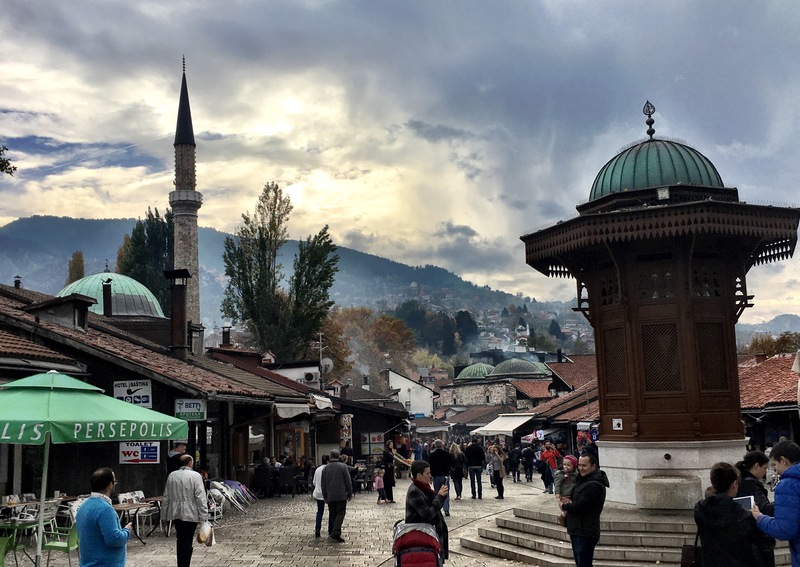 But Sarajevo has a tragic history that is hard to imagine as you walk the colourful streets of the Stari Grad markets. 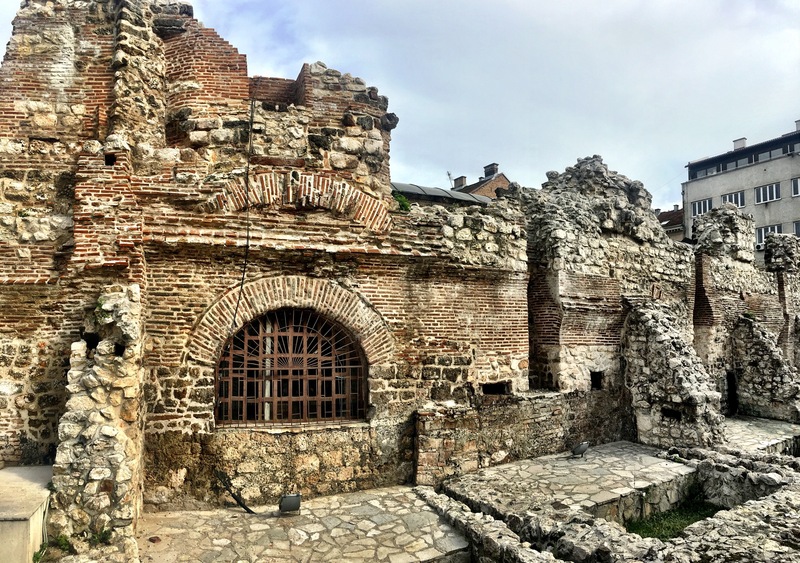 Apart from being known as the city that sparked WWII after the assassination of Franz Ferdinand, Sarajevo also is noted for having the longest city siege in the history of modern warfare. The siege on Sarajevo during the Bosnian war began April 5th, 1992 and lasted 1425 days: just shy of four years. That’s three times longer than the infamous Battle of Stalingrad. The city was surrounded by Yugoslav forces from Serbia. At the collapse of Yugoslavia, the Bosnian-Serbs hoped to create an independent republic of their own, with the capital as Sarajevo. They surrounded the city and strategically placed themselves in the hills around the capital. For the next four years, they never even had to enter the city; instead, they used sniper fire and bombs to wreak havoc. It was Hell. Our tour guide in Sarajevo was a young man named Neno. 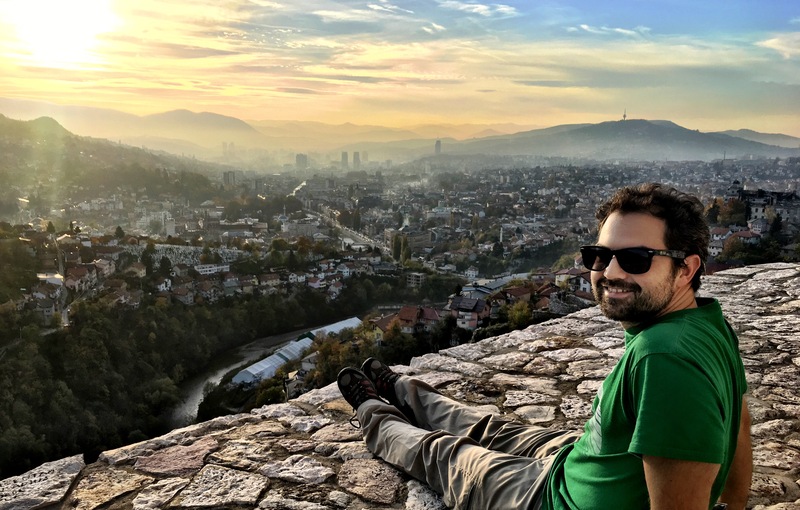 He was only a boy when the war struck in Sarajevo, but he remembers it well. He and all his neighbours were forced to move into the basement of their building. They lived together as a small community, eating whatever food they received from UN air drops, listening to the bombs above: for four straight years. The city was torn to pieces; major landmarks, including the city hall and local brewery were prime targets. The brewery in Sarajevo was built over a fresh spring. It was the city’s only source of water during the war times. Hundreds of civilians died while waiting in line for water. Snipers attacked soldiers and civilians as if they were equal. By the end of the 4 years, nearly as many civilians had been murdered as soldiers. But Sarajevo remembers. At each place where a shell exploded and killed citizens, a red “rose” is now painted into the concrete. It’s a sobering realization when you stumble upon one of the many splotches of red paint that scatter the city streets. This was the first point in the trip where I realized I understood very little about the decline of Yugoslavia. And this epiphany only grew stronger as we travelled deeper into the Balkans. But despite spending a significant amount of time enveloped in the horrors of war, we actually had a wonderfully relaxing time in Sarajevo. Cafe hopping in the day, a museum here and there, and late afternoon hikes into the hills. 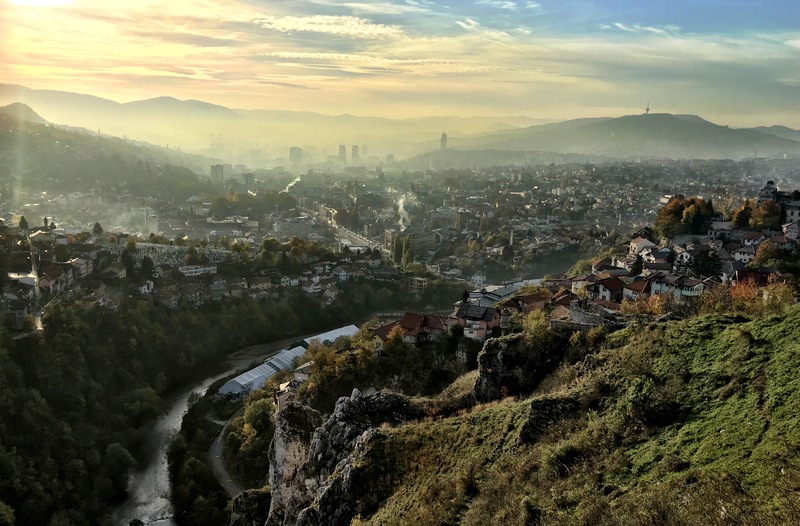 The view from the Bijela Tabija at the edge of Sarajevo is well worth the climb. Low hanging mist in the valley made the city seem as if it were emerging from a dream. Young teens and couples hang out on the walls of the abandoned white fort while the sun sets. Wild sheep and stray cats graze the last green patches of grass within the old walls. The structure is nothing more than stone ruins, towering over the sprawling city below. It is beautiful. 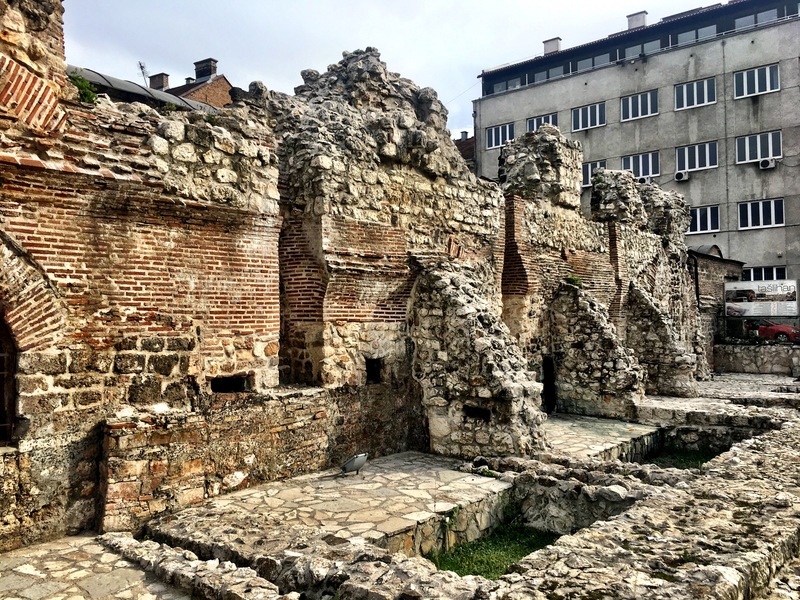 I was surprised at how quickly Sarajevo captured my interest. It’s middle eastern influences were unlike any other city we had come upon in Europe yet. The place was both exotic and familiar at the same time, and everyone was more than welcoming. Sarajevo is a gem in the mountains of Bosnia, and as we head South through the region, I hope to find more places like this.